This challenge got me thinking. Most of the requirements could easily be met using something like LiDAR – flood the target with enough laser sensors and you could track all the way down to the crickets chirping in the grass, in 4D. But the real challenge in this requirement is for a passive sensor that does not give away the user or sensor location. LiDAR and other systems that could tackle this challenge are all active systems – continuously bathing the target area with active signals in order to collect data. This makes them easy to detect with fairly rudimentary electromagnetic spectrum receivers (i.e., radios tuned to the right frequency). So I started thinking. How could this problem be tackled with a passive collector system? For an old topographer like me the answer is simple – photogrammetric technology! A pair of video cameras that collect high resolution imagery in a variety of spectrums (visible and passive IR) and have modern night vision capability could easily collect real time stereo still imagery (3D) and video (4D). They’d have to sit along a calibrated baseline, but that’s easy to establish using military grade GPS. All of this technology could be easily squeezed into fairly small, man-portable units. The data would have to be uploaded to computers for post-processing and visual display, and for real or near-real time use that implies some sort of a communications link. But still, the data collection part seems to me to be a simple application of available technology. Hmm… maybe it’s time I hang out my shingle as a defense industry consultant! 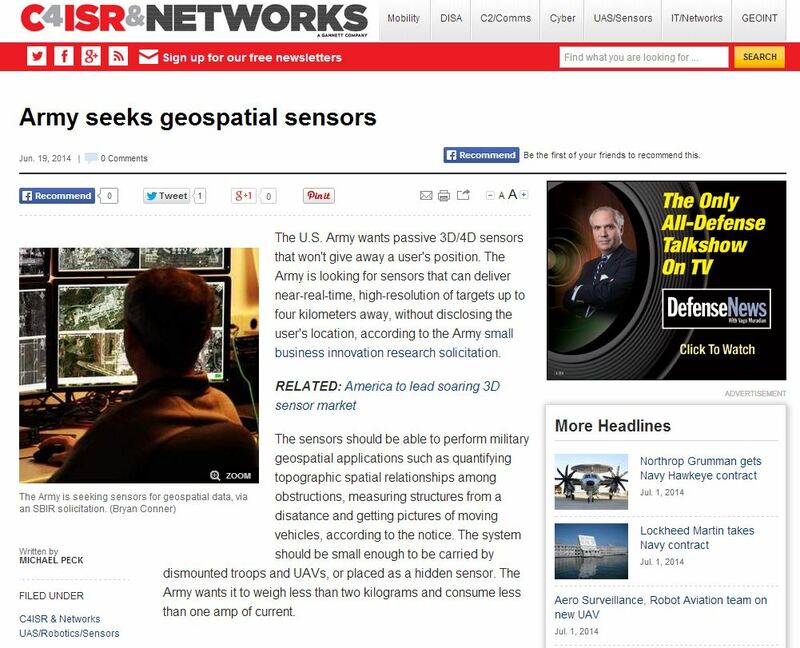 This entry was posted in General, gis and tagged army, geospatial by Brian Haren. Bookmark the permalink.